We’re now 5 weeks into the NFL season, which means it’s that time of year again! Time to mathematically eliminate the Browns from the playoffs? No! 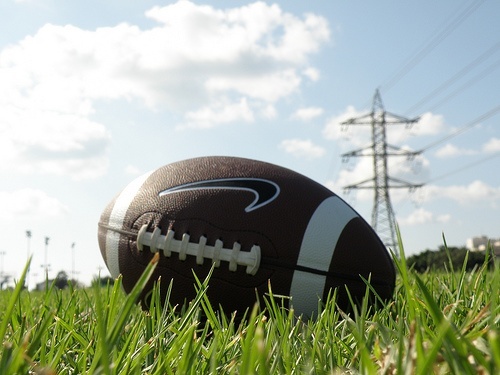 It's time to win your fantasy football league! (Besides, I thought the Browns were eliminated in week 3). The past two years I’ve created a regression model that uses a player’s average fantasy score from the first 5 weeks of the season to predict their final season average. The regression model has performed quite well, so I don’t see any reason not to do the data analysis again this year! Previously, I used just one predictor in the model, the number of fantasy points per game the player has averaged in their first 5 games. This yielded an R-squared value of about 81%. That is, 81% of the variation in a player’s average at the end of the season can be explained by their average in the first 5 weeks. But this year I decided to see if I could do any better by adding a second predictor, so I added the percentage of the player’s points that came from touchdowns. My thinking was that a player who has scored a lot of touchdowns but not gained many yards might not be as lucky going forward. Similarly, a person who has gained a ton of yards but hasn’t found the end zone too frequently might outperform their average going forward by scoring a few more touchdowns. I went to kffl.com and gathered data on 103 players from last season. I calculated their fantasy average through the first 5 games and the percentage of their fantasy points that came from touchdowns. 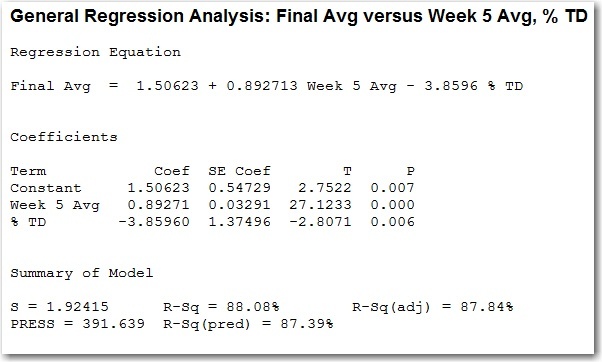 Then I used Minitab’s general regression analysis to analyze the data. By looking at the Coefficients table, we see that the p-value for both “Week 5 Avg” and “% TD” are less than 0.05. This means both predictors are statistically significant when it comes to explaining a player’s final average. We also see that the R-squared value is 88% and the R-sq (pred) is 87.4%. R-sq (pred) is a more appropriate metric than R-sq or R-sq (adj) for comparing the predictive ability of various models. But since R-sq (pred) is just as high as the r-squared value, we're good to go with this model! * Indicates a player that has not participated in 5 games yet this season. The predictive model is based on players who played in all of the first five games in previous seasons, but, here, the model is used to predict some players who have not yet participated in 5 games this season. Drew Brees looks to be the top dog when it comes to quarterbacks. No surprise there, as that tends to happen when you’ve gone 48 consecutive games with a touchdown pass. But the next three guys are very surprising. Matt Ryan is playing great football, RG III is this year’s Cam Newton, and is that Andrew Luck? His average is only for 4 games, but it looks like all the hype surrounding him was legit. He’s averaging just over 300 yards and almost 2 touchdowns per game. I doubt anybody will trade RG III or Matt Ryan at this point, but if you can get your hands on Luck, trade for him! And if you already have Luck, you probably drafted him as your backup. At this point, start him and see what you can get for the guy you drafted before Luck! And now he’s projected for 8th! I’m sure nobody saw that coming. And things aren’t going to get easier for him, as he faces a tough defense in Houston this week. The odds of Rodgers finishing as a top 3 quarterback this year don’t look good. Speaking of not looking good, if you drafted Schaub, Romo, or Rivers to be your starting quarterback, it’s panic time. Andy Dalton is a quarterback that wasn’t on anybody’s fantasy radar before the season, but he’s almost a top 10 quarterback! I would jump ship on the other guys and try to acquire Dalton. Arian Foster is a beast. That is all. 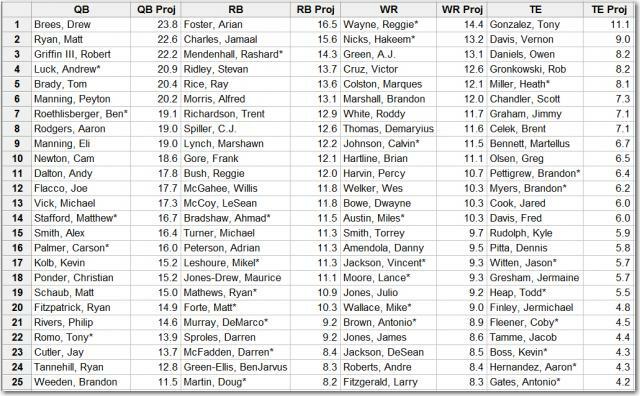 We see Rashard Mendenhall at #3 here, but his projection is based off of only 1 game. So I wouldn’t put very much stock in it. But two players I would put stock in are Steven Ridley and Alfred Morris. Both appear to be the real deal. Don’t get too excited about CJ Spiller ranking #8. The model can’t account for injuries, so it doesn’t know he racked up a ton of points when Fred Jackson was out. Jackson has since returned, so don’t expect Spiller to finish at #8. Man, drafting running backs is tough. The preseason RBs ranked third through fifth were LeSean McCoy, Maurice Jones-Drew, and Chris Johnson. Their current projections say they’ll finish 13th and 18th, and I can’t count that high. Yet more proof that you should wait in your fantasy draft to grab a wide receiver. None of the top 5 preseason wide receivers (Calvin Johnson, Andre Johnson, Larry Fitzgerald, Roddy White, Greg Jennings) are in the top 5. Meanwhile, Reggie Wayne was, on average, the 31st receiver selected! Hakeem Nicks is projected as the 2nd best receiver, but his average is based off of only 2 games. So we can’t be confident in that projection. Brian Hartline is still available in 9% of EPSN Fantasy Football leagues, and he’s a top 10 receiver! Even if he’s already owned, you might be able to trade for him pretty cheaply. And on a related note, Andre Roberts is projected as the 24th best receiver and is only owned in 36% of ESPN leagues. And by the way, this weekend his team plays the Bills, who give up a ton of points to receivers. Last year, there were 5 different tight ends averaging over 10 points per game. This year Tony Gonzalez is the only one (although if Jimmy Graham didn’t sprain an ankle and put up a 0 last week, he’d be averaging just over 10 points per game). But Graham did sprain his ankle, which means the difference between Tony Gonzalez and the second best tight end is greater than any other position. So, can you use these projections to make any trades? I've already traded for Luck in one league, and I'm trying to get Charles for McCoy in another. Let us know if you've been able to use these projections to pull off any deals! Photograph by RonAlmog. Images licensed under Creative Commons Attribution ShareAlike 2.0.